“Colin Comer has done it again! What his last spectacular book Shelby Cobra 50 Years was to the Texan’s snakes his new Shelby Mustang Fifty Years is to Shelby’s Mustangs. 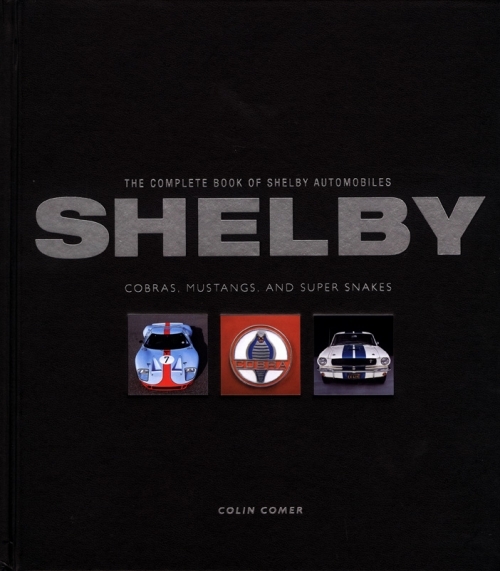 It is the perfect addition to any Shelby or Mustang enthusiast’s library. Somehow Colin seems to come up with new, unseen historic photography as well as the latest images of fantastic perfect restorations, like those of the first production and racing versions of the GT350 Shelby Mustang 5S003 and 5R002. Celebrate the 50th Anniversary of the Shelby Mustang! From the original Shelby Mustang GT350 to today’s 1,000 horsepower GT500, Carroll Shelby, Shelby American, and the Ford Motor Company have defined high-performance with their Shelby Mustangs. Shelby built his Mustangs from 1965 until 1970, at a time when it seemed that the muscle car was a dying breed. Then an odd thing happened: people began to realize the classic nature of the car almost as soon as Shelby stopped building them. By the end of the 1970s the original Shelby Mustangs had attained classic status just like much older storied American makes such as Auburn and Duesenberg. After a much-too-long hiatus, in 2006 Carroll Shelby was back with Ford and production of new Shelby Mustangs began for the first time in 36 years. Today Shelby Mustangs of all eras remain at the top of almost every “car guys” list and with good reason- they are America’s premier do-it-all pony car. Shelby Mustang Fifty Years is a celebration of these magnificent machines and covers every iteration from the raw 1965 GT350s to today’s Shelby 1000 monster. More importantly it profiles the men that made it all happen like “Mr. GT350” Chuck Cantwell, Peter Brock, and the men that keep the dream alive today like Jim Farley of Ford Motor Co. 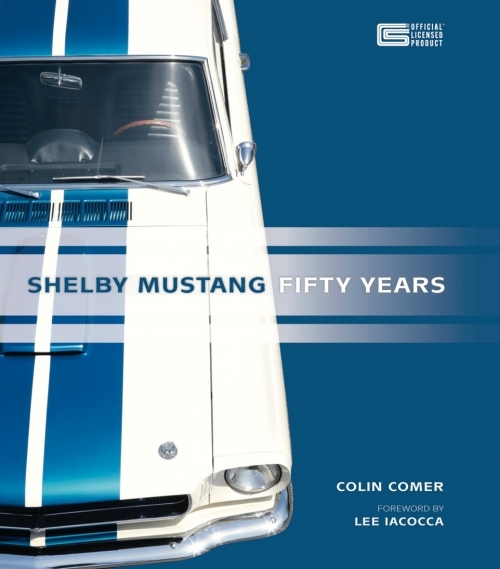 Created in cooperation with the Carroll Hall Shelby Trust and officially licensed by Carroll Shelby Licensing, Inc., Shelby Mustang Fifty Years is lavishly illustrated with rare, historic photography and modern color images to chronicle the story of these amazing cars, from the initial collaboration with Ford to today’s record-setting high-tech muscle cars. 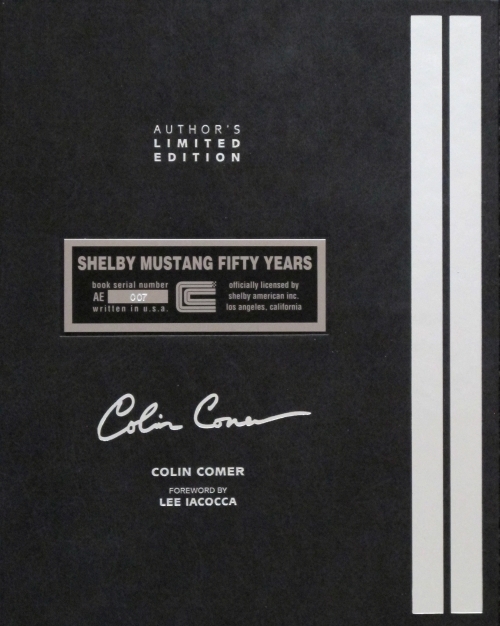 Foreword and tribute to Carroll Shelby by the “Father of the Mustang” Lee Iacocca. “Colin Comer has done it again! What his last spectacular book Shelby Cobra 50 Yearswas to the Texan’s snakes his new Shelby Mustang Fifty Years is to Shelby’s Mustangs. It is the perfect addition to any Shelby or Mustang enthusiasts library. Somehow Colin seems to come up with new, unseen historic photography as well as the latest images of fantastic perfect restorations, like those of the first production and racing versions of the GT350 Shelby Mustang 5S003 and 5R002. Just when we think we’ve seen the last serious book on Shelbys anyone could possibly write, along comes another one. 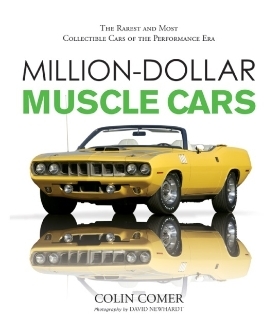 Well, no kidding, this is the last one, and we’re not issuing a challenge, here: aside from some new color photos, it probably isn’t possible to spin the Shelby Mustang yarn again and make it as interesting as Colin Comer has done in this book. This is the third Comer Cobra/Shelby book in fairly quick succession, which demonstrates his ability to keep his nose to the Shelby grindstone. The foreword was written by Lee Iacocca and how Comer was able to arrange that is anyone’s guess. Incriminating photos? If anyone could turn them up, Comer can. Everything about this book screams quality. The color photographs are excellent and the paper is so thick you’ll pinch the pages while turning them thinking two are sticking together. Most of the photos are displayed in oversized format, making the text appear to shrink. It’s an optical illusion. The writing is as factual as it gets and tightly edited; no wandering, no tangents, no fluff or filler. This is Comer’s finest book yet. 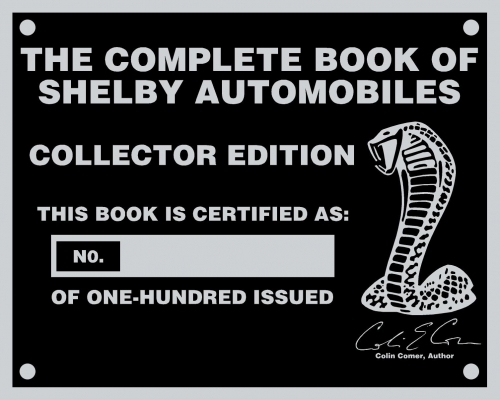 If you consider yourself a real Shelby person, this book should be on your coffee table. If you’re not, it just might make you one.